Approximately 50 broadsides, booklets, pamphlets and printed paper items by the Irgun (Etzel)and Lehi (most by the Irgun). Palestine (one item printed in New York), late 1930s to late 1940s. • Eighteen broadsides and notices printed by the Irgun: an early broadside from 1939, calling for the release of Jewish prisoners from British jails; a sharply worded broadside from the "Saison" period condemning Haganah acts and threatening retaliation; a broadside from 1947 notifying the public of the British intention to execute Dov Gruner, and warning the British government that the sentence must not be carried out; a broadside from 1947 on behalf of the "Court of the Irgun", notifying the public of the execution of sergeants Clifford Martin and Mervyn Paice; broadside from 1947 detailing the involvement of the Haganah organization in the explosion at the King David Hotel; broadside from 1947 notifying the public of the planting of landmines along train routes in Palestine, and warning Jewish and Arab citizens that they should avoid boarding trains; broadside addressed to the Scouts organization in Haifa, in an attempt to persuade members to join the Irgun rather than the Haganah; and more. • A dozen paper labels and propaganda notes of the Irgun, with propaganda slogans and Biblical verses. • Three Irgun posters, including a poster of the radio station "Kol Tsion HaLochemet" (Voice of Fighting Zion) from April 25, 1948, notifying the public of the beginning of daily news broadcasts. 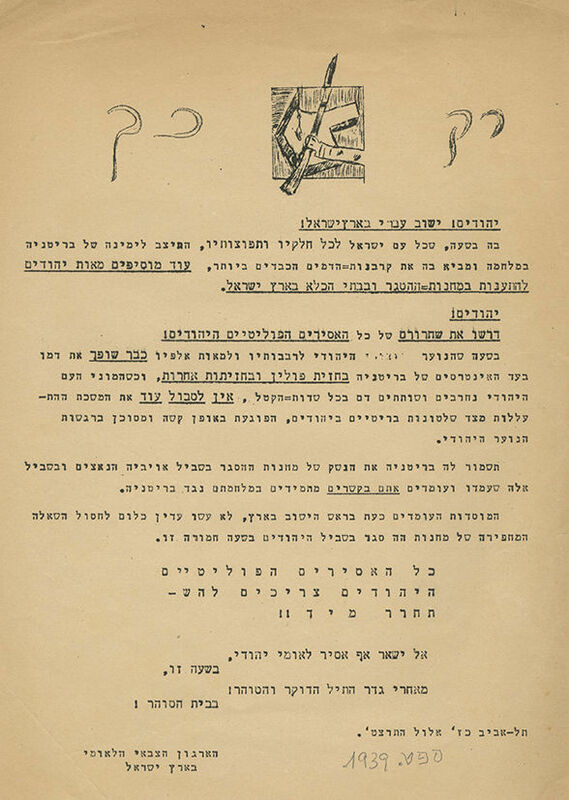 • Mourning notice published following the execution of the "Olei HaGardom" Dov Gruner, Dov Rosenbaum [Yehiel Dresner], Mordecai Elkoshi [Elkahi] and Eliezer Kashani, on June 16, 1947. • "Commanders' Anthology 2, Talks to New Recruits", printed booklet with instructions on how to conduct talks with new Irgun recruits: the organization's ambitions, its military nature, secrecy and other issues. Dedicated in print to the organization's commander David Raziel. Ca. 1940s. • In Kenyan Exile, Daily Newspaper, Published in the Camp of Jewish Citizens in British Detention in Kenya. Issue no. 370 from May 30, 1948, with reports from the front of the War of Independence and a review of discussions at the Security Council. • "Letter to Every Loyal Hebrew – to Every Young Organized Hebrew – in the Homeland", booklet by the Irgun and Lehi, typewritten and mimeographed, addressing the Jewish Yishuv and calling on it to avoid a civil war. Printed in Heshvan 1944. • "Statements of the Accused in the Cairo Trial, whose Publication was Prohibited by the President of the Court", booklet by Lehi, typewritten and mimeographed, with the statements of the two assassins of Lord Moyne, Eliyahu Bet-Zuri and Eliyahu Hakim. Printed in 1945. • HaHazit [The Front], the Lehi newspaper. Issue no. 18, from Nissan 1945. Enclosed: Broadside with a notice from High Commissioner Alan Cunningham, broadcast on the radio on June 30, 1946 following the explosion at the King David Hotel.